Types of wines: Generous, full-flavored and moderately tannic red. Charming but sophisticated dry rosés. 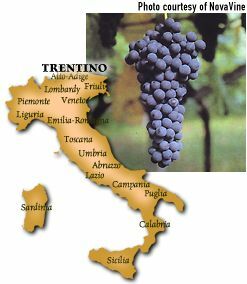 Origin: Found only in Trentino, more precisely on the Rotaliano plain, Teroldego is locally prized and can stand toe-to-toe with other rich Italian reds. Description: Many feel Teroldego bears a great resemblance to Zinfandel with its deep color, brambly blackberriness, vivacious acidity and moderate tannin. Aging: It is suggested that Teroldego is most enjoyable with no more than three years bottle age, while the fruit is still boisterous. However some, from Italy's best wineries, have been known to improve for up to ten years. FastFoodFacts: Very enjoyable with robust and spicy dishes- curries, paprikash, etc. and tangy barbecued meats of all types.